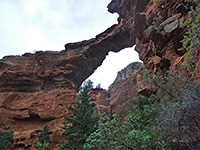 There are several red rock arches near Sedona including Vultee Arch, Fay Canyon Arch, and probably the most viewed, Devils Bridge, situated at the edge of a wide valley on the north side of Capital Butte. 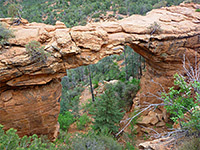 Despite its name, the formation is still an arch rather than a bridge - created by wind and weather erosion and not by flowing water - and can be reached by a minimum hike of 0.8 miles, starting from a small trailhead along Dry Creek Road. This is only accessible to 4WD vehicles however; 2WD parking is 1.1 miles away, while an alternative starting point is the Long Canyon Trailhead, from where a recently created path (the Chuckwagon Trail), links with the bridge trail. Whichever route is used, the hike is quite easy; mostly level, with just a short, steep climb at the end. The main path ends right beneath the arch and another branch ascends to the top, where the views are better - up and down the canyon, over the red and white rocks at either side, and westwards across the wider valley of Dry Creek to the more extensive canyons and mesas of the Red Rock-Secret Mountain Wilderness. Panorama of the valley below Devils Bridge. Dry Creek Road used to be accessible to regular vehicles at least as far as the Secret Canyon trailhead (3.4 miles), but the surface has deteriorated in recent years and 2WD vehicles now have to be left at a newly constructed parking area right at the start, so for most people, the hike to Devils Bridge begins here, and the first 1.1 miles is along the road, which is wide, often dusty, and receives high ATV use. It runs alongside Capitol Butte while staying fairly level, winds round a drainage and then straightens again and reaches the turn off for the 4WD trailhead, which has space for only seven vehicles. Right opposite this junction is a section of the Chuckwagon Trail (open 2012), which connects with the alternative start point on Long Canyon Road, a walk of one mile. This crosses fairly overgrown terrain, but is perhaps a more scenic route, avoiding the noise and dust from ATVs along Dry Creek Road, though the path is also used by cycles. Another option is via a link path that parallels Dry Creek Road, starting at the 2WD parking lot. 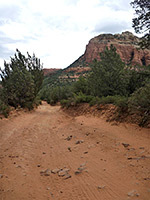 Vehicles using any of the parking areas do not require the Red Rock Pass ($5 per day), as, following a recent change in regulations, this only applies to locations close to Oak Creek and along Hwy 179 south of Sedona. 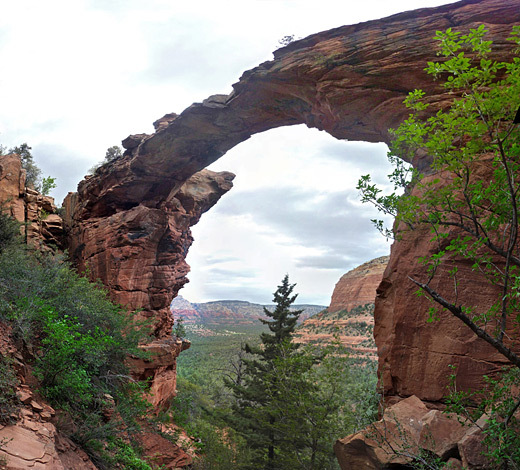 The actual Devils Bridge Trail (0.8 miles) is also wide and well used, leading up a broad valley, over red earth and slickrock terraces, surrounded by typical Sedona vegetation of juniper, pinyon pine, opuntia, yucca and agave. The path rises quite steeply at the end by about 300 feet, through manzanita bushes, to the base of the bridge, which comes into view only when right overhead. 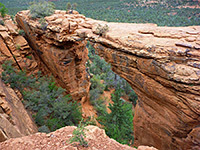 Like Fay Canyon Arch, the bridge has formed at the edge of a plateau, directly in front of a cliff, so is best appreciated from behind or above. Both arches are composed of Supai sandstone, colored a rich shade of red. 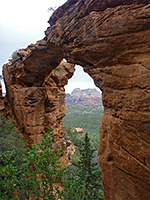 The short continuation trail to the top of Devils Bridge ascends via steps up the west side, while for the more adventurous, a quicker way is to climb the rocks behind, on the east side. Visitors are almost encouraged to walk right across the top of the arch, so it must be considered perfectly sturdy, though this is still quite unusual, as most such hikes are accompanied by warnings to stay well away from any exposed areas.